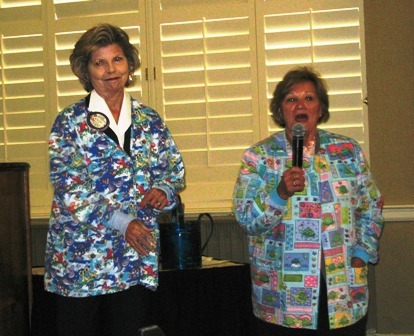 Joliet Rotary members were all smiles at a recent meeting when Drilling into Dental History was not only the theme of Rotarian, Dr. Pete Nichols’ presentation, but the subject for a special Sergeant-of-Arms presentation with Diane Habiger and Jackie McTee. Habiger and McTee drilled a group of Club volunteers while asking a number of questions about Dr. Nichols and his dentistry practice. Volunteers chipped away at the answers, allowing the special Sergeant-of-Arms to collect quite a few dollars for charity. 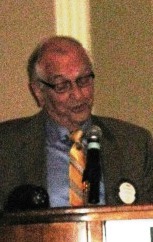 During the presentation Dr. Nichols, who began practicing dentistry in 1952, filled Joliet Rotarians in on the history of dentistry and the differences today. He retired two years ago. “When I began practicing, there were no dental assistants, hygienists, facemasks, gloves, etc.,” said Nichols, adding that a gold crown was $40 to $50, while a bridge cost about $150 during his early practice.